This year, we had the absolute pleasure of having a phenomenal photographer accompany us to most of our games. Maya Devereaux was there the whole year to capture visually what we couldn’t capture in writing — and did a phenomenal job with that. We had Maya narrow down some of her favorite pics from this memorable season to a top 10, and give a little background behind each photo. You can also find more of her photos from this season on our Flickr. It might’ve felt like an eternity. In fact, it was 1,093 days. But at long last, the losing streak is over. The No. 2/3 Boston University men’s hockey team overcame a two-goal deficit and record-breaking goaltending performance to dispatch No. 4/6 Harvard University, 4-3, in double overtime in the Beanpot semifinal at TD Garden. 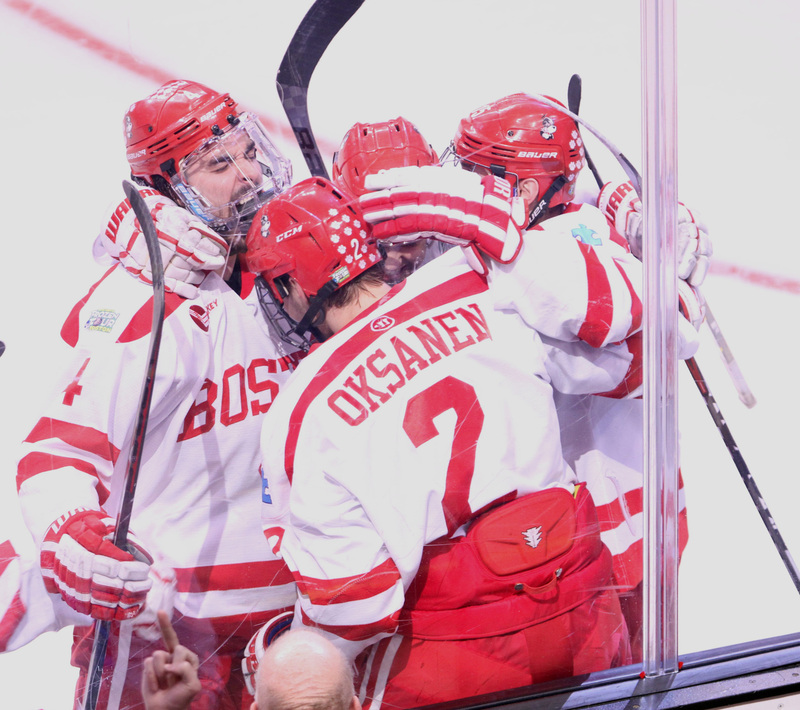 Sixty-seven shots later, the Terriers (17-4-4, 11-2-2 Hockey East) won it on a goal from junior forward Danny O’Regan 2:18 into the second overtime period. Down by two in the middle of the second, freshman forward Nikolas Olsson and junior winger Ahti Oksanen tied the game up, which set up a dramatic third and overtime periods. 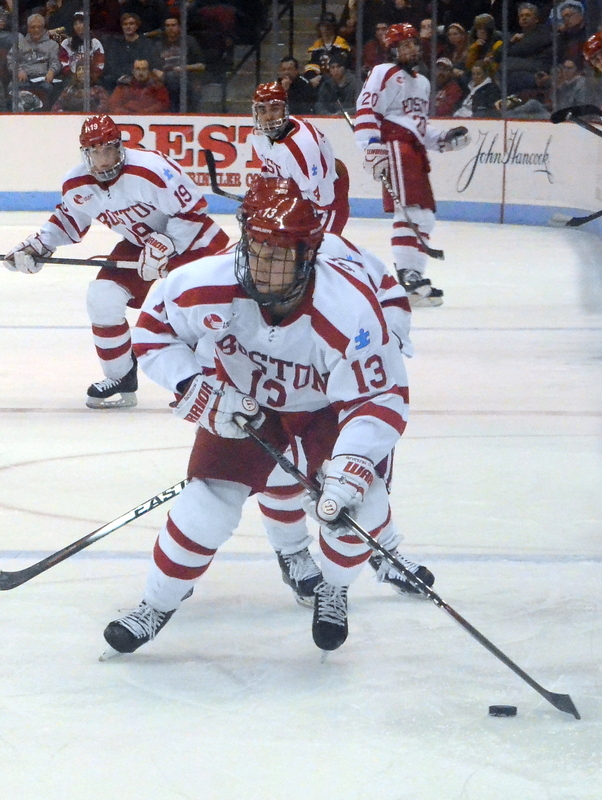 BU dominated for large portions of the game, but it wasn’t perfect. As always, things went right and wrong for the Terriers. Here’s the Beanpot semifinal edition of Pluses and Minuses. It seemed at just about every turn, Harvard (12-6-2) netminder Stephen Michalek bailed out his defense. 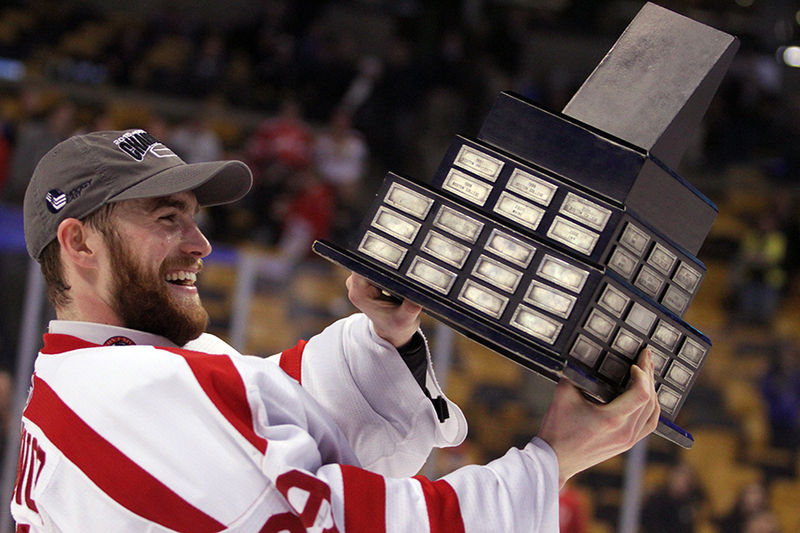 With 63 saves, a new Beanpot record, he at times looked impenetrable. One Crimson turnover changed everything. As Harvard attempted to clear its own defensive zone, senior assistant captain Evan Rodrigues got in the way of the exit pass. O’Regan saw this, and immediately charged toward the crease. Rodrigues made a crisp centering pass to the Needham native, who finished off the play with a wrister into an almost-open net. Michalek had no chance to make that 64th save. BU’s other senior assistant captain went all the way from Nov. 22 to Jan 23 without scoring a goal. At certain points over the last month-and-half, BU coach David Quinn even moved the center to the third line at points. Over the last few games, including Tuesday night’s, Hohmann looks to be back in form. He opened up the scoring at the 16:50 mark of the first, as he found himself perfectly positioned in the crease to finish off a good passing play from Rodrigues. Arguably even bigger was assist he made to Oksanen that tied the game in the waning seconds of the second period. Believe it or not, but the Terriers were actually getting outshot and outplayed by the Crimson at the end of the first and beginning of the second. Harvard capitalized on sloppy in-zone defense and went up 3-1 in the first 10 minutes of the second frame, but more on that in the minus section. After awhile, though, BU found its groove and fought back. 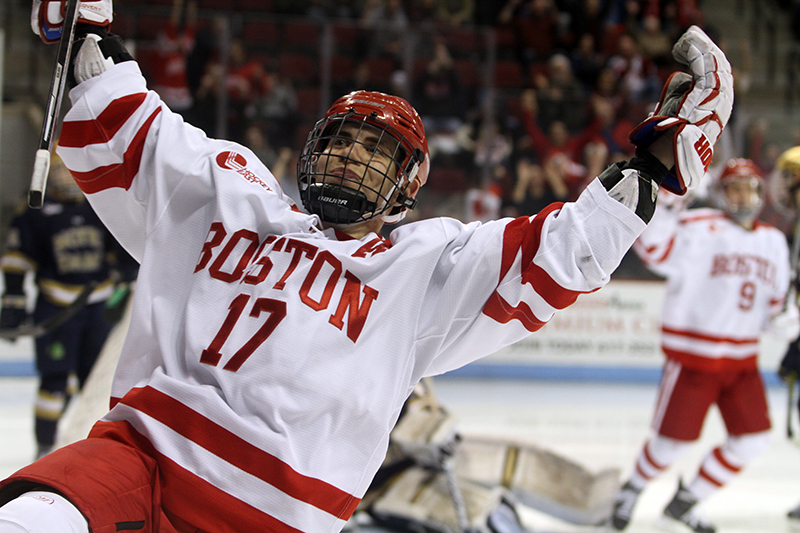 What initially looked to be a failed BU opportunity actually led to the first goal of the comeback. Olsson sprang Nick Roberto on a long lead pass through the neutral zone, all but giving Roberto a 1-on-1 showdown with Michalek. But on the ensuing breakway, Roberto shot well high of goal. Undeterred, the third line kept the puck in the zone and created another opportunity. This time, the unit cashed in. Roberto worked his way open in the slot and fired off a shot that created a big rebound. Olsson, as he’s done so many times this season, crashed the front of the net and picked up the loose change for his fifth goal. Four minutes later, Oksanen connected on his 17th of the year off a nice feed from Hohmann. And like that, the tide of the game turned. After a little bit of a lull at the end of the first period and start of the second period, the Terriers kicked it into high gear and amped up the pressure on Michalek. In the third period and first overtime, the Terriers generated 72 total shots, 32 of which hit net. 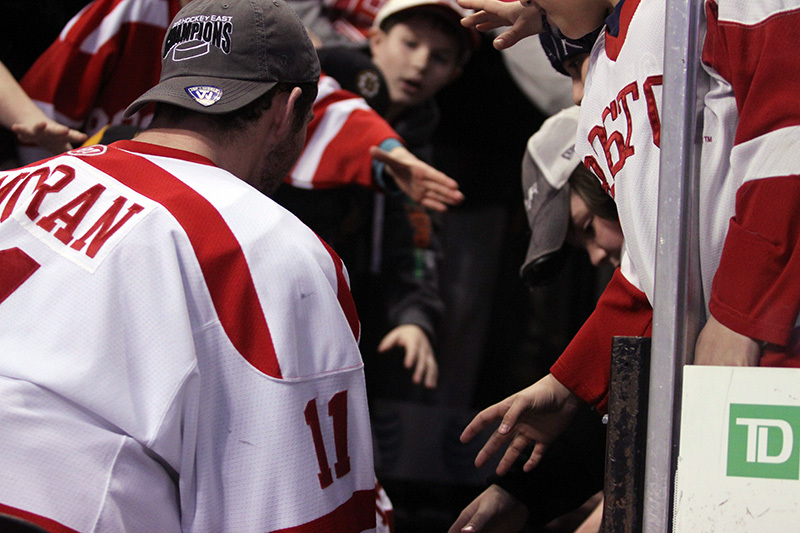 By the time O’Regan scored, the Terriers had attempted 123 shots — more than double Harvard’s shot attempts. It took some stellar goaltending, a few key blocks and some puck luck for Harvard to force the game as far as it did. The aforementioned second goal came off a bad exchange behind junior netminder Matt O’Connor. Freshman defenseman John MacLeod fed junior captain Matt Grzelcyk behind the net, who in turn gave the puck right to Harvard. The turnover all but set up forward Alexander Kerfoot’s goal 22 seconds into the frame. It didn’t end up costing the Terriers in the long run, but it, and some other bad defensive plays later, put the team in bad position to start the second frame. 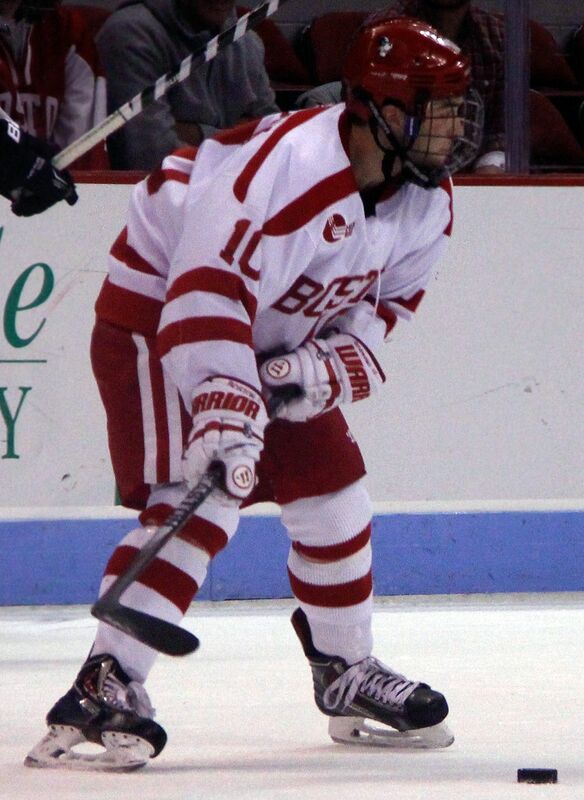 Not exactly a clear-cut minus for BU, but Michalek’s performance for Harvard is worth at least a mention. Admittedly battling cramps, the backstop made a combined 32 saves in the third period and first overtime. A few times he was bailed out on some blocks, though for the most part, Michalek was impressive during his career-best day. MADISON, Wisconsin — No late-game deflections were needed this time for the No. 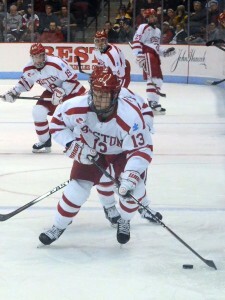 2 Boston University men’s hockey team. Behind freshman forward Jack Eichel’s four points, the Terriers (12-3-4, 7-1-2 Hockey East) cruised to a 6-1 victory over the University of Wisconsin on Saturday at the Kohl Center. A new-look first line composed of Eichel, senior assistant captain Evan Rodrigues and junior winger Danny O’Regan combined for five of the six goals. For his part, freshman netiminder Connor LaCouvee made 32 saves in his return to the crease. If there were any fears that the freshman was in the midst of a slump, Eichel allayed those — and then some. Trailing by a goal early in the second period, the Terriers were in need of a goal to get back in the game. Eichel came through. As he skated in through the left wing, he had the opportunity to feed Rodrigues as he charged low to the net. But instead of making a cross-ice pass, Eichel dangled through multiple defenders, turned around and fired a wrister that Badgers (2-12-2) goaltender Joel Rumpel had little chance to stop. Eichel connected on his second goal of the game on a power-play opportunity as he threw a puck in between a well-placed screen in front of the net. On the man advantage midway through the third, it appeared like Eichel might have scored his third of the night, but O’Regan deflected the puck past Rumpel, so the freshman was credited with the assist. As if he didn’t have enough spaces on the stat sheet filled, the North Chelmsford native started a shorthanded 2-on-1 with O’Regan, who tapped the puck into a gaping net at 11:32 in the final period. 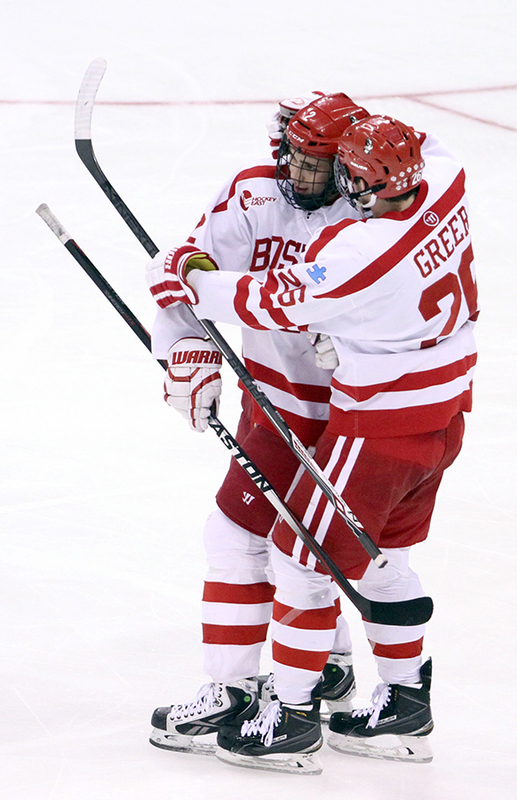 BU coach David Quinn said a down game on Friday fed into a positive one on Saturday. Yes, Eichel had a stellar night, but his linemates weren’t too shabby either. Instead of Oksanen playing at one of the wing spots, Quinn shook things up and bumped Rodrigues up, while Oksanen slid into the second unit. The move paid off, as the new trio finished with 10 combined points. O’Regan scored two goals off of Eichel primary helpers, and Rodrigues finished the night off with a goal in which he toe dragged around a diving Badgers defenseman and wristed the puck high over Rumpel. The addidtion of Rodriuges to the group didn’t affect the chemistry the line previously had, O’Regan said after the game. It had not been since Nov. 30 that the freshman started a game. If he had any cobwebs, it didn’t show. It was his best game since opening night in Amherst. He finished the night with 32 saves, including 17 in the third period alone. It was not just the saves he made, but the way he made them that stood out. Time and time again he used his right pad to kick away most rebound attempts to the side boards. His only blemish came two minutes into the second period when forward Jedd Soleway jammed a loose puck into the net. For a long stretch in the first half of the season, the Terriers were without the 6-foot freshman forward. 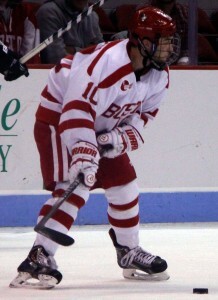 Since Nikolas Olsson’s return to the lineup on Jan. 3, BU has benefitted from his gritty efforts. The freshman seems to find his way fighting for the puck near the boards or down low in the crease. This is exactly how he found the back of the net Saturday. As he pushed to the net after an initial shot from sophomore forward Nick Roberto, Olsson bounced on the rebound and deposited the puck into the cage for his second goal in three games. Up 3-1 to start the third period, the Terriers sat back and let Wisconsin rack up offensive-zone time. In just the first few minutes, the Badgers held a 6-0 shot advantage in the frame. 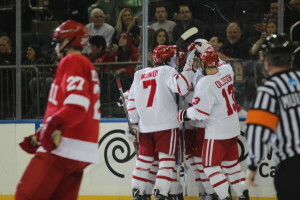 Although BU scored three goals in the final 20 minutes, Wisconsin outshot the Terriers 17-12 to end the game. Quinn said the problems that led to so many Wisconsin chances need to be addressed.